There are two main reasons for modifying the Fiesta suspension setup. The first is to improve the look of the car, the second is to improve the handling. The reasons you have for lowering the car should dictate the setup you go for, as will your budget. When lowering a car to enhance it’s appearance, the object of the exercise is to eliminate the gap between the tyre and the arch. 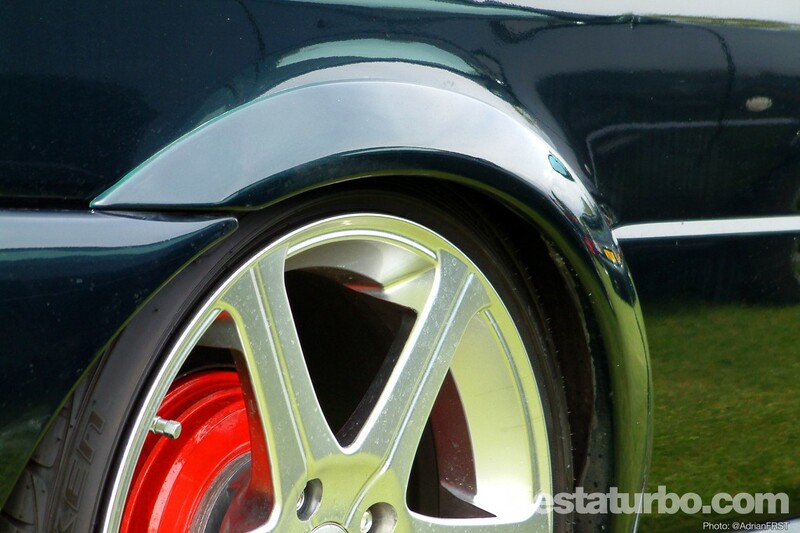 Although the oft used term ‘lower is better’ is true to a certain extent, excessive lowering often has detrimental effects to the handling of the car, as described later on in this section. The cheapest and easiest way to lower the car is to fit a lowering spring kit from a manufacturer such as Jamex, Spax or Chassis Dynamics. The kits consist of 4 springs that are both shorter and approximately 25% stiffer than the original Ford items. How much shorter they are depends on the kit you buy. They are sold by the amount that they will lower the car e.g 35mm or -35 indicating a 35mm drop. Kits available for the Fiesta are -25, -35, -50 and -65mm. Bear in mind that Ford made the RST 25mm lower as standard than an XR2i or Si. This means that a 25mm lowering kit on an RST will leave it at the same height as standard. The same kit on an XR2i will lower it by 25mm. It is possible to shorten springs by removing a coil, however this is definitely NOT recommended. The springs are likely to dislocate from the spring cups when the car is raised on ramps, or even after taking a humpback bridge at speed, and the spring will no longer compress and de-compress as the manufacturers intended. The way the spring sits on the shock will also be affected, as the last coil at each end of the spring is flattened to provide a stable base on the spring platform. Chopping a coil off will remove the flat section and the spring will no longer sit securely in the cup. If you are lowering the car to improve the handling, a drop of 35mm or so should be enough, any lower and the amount of suspension travel is reduced and can lead to the shocks bottoming out. Using lowering springs on the standard Ford shocks is far from ideal, as the combination is no longer matched and this can lead to a bouncy ride and unpredictable handling, so it’s better to go for shortened and uprated shocks. Uprated shocks are both stiffer and shorter than standard ones. They are designed to be used in conjunction with lowering springs, either from the same or different manufacturers. The shocks can be bought individually, such as the Koni items, or as a kit complete with matched springs, for instance the Spax SSX kits. Some shocks are marketed as ‘Adjustable’, meaning the damping stiffeness can be adjusted. On the Fiesta this is usually done with a plastic knob on the front strut tops under the bonnet and a small adjuster wheel on the bottom of the rears, where the shocks mount to the rear beam. The ultimate in Fiesta suspension kits is a coilover setup. Coilovers are basically shocks with perfectly matched springs which are 2.25” in internal diameter and therefore not as wide as standard springs. There are a number of benefits to this design. The first is that the damper body has a thread on it and the spring platform can be adjusted up and down this thread to provide adjustment in ride height. Most kits will provide an adjusment range of 100mm or so and lower the car between 30 and 50mm on the highest setting. With the spring platforms wound down, it is possible to lower the car by over 100mm, as demonstrated on Angus Munro’s RS 1800 in the Magazine Featured Cars section. The ride height can be adjusted without removing the kit from the car, it’s usually a case of removing the wheels to gain access to the spring platform. It’s worth noting that when adjusting the ride height the geomentry of the car will become affected and the tracking and alignment of the wheels should be checked and adjusted if neccessary to prevent premature tyre wear. Coilovers are ideal when fitting large wheels. The springs, being narrower than standard or ‘regular’ lowering springs, provide better clearance, as the spring platform is less likely to come into contact with the wheel or tyre. The stiffness of the dampers are adjustable on the car in the same way as the adjustable shocks mentioned above. Coilovers have a reputation for having a harsh ride. This is usually down to the stiffness of springs that are supplied. With coilovers being primarily designed for track use, the poundage of the springs is usually much harder than normal lowering springs, however there is a massive range of springs that fit coilovers, all with the same internal diameter but differing in poundage (stiffness) and length. This enables ultra fine tuning of both the ride height and stiffness of the car, so you can fit harder springs to match your driving style or shorter ones to lower the car further. As described above, fitting much shorter springs can lead to them dislocating from the spring platforms when the car is raised. There is a solution to this when using coilovers. Helper springs are flat section springs that are very soft in poundage and are used to support the main spring when the damper (shock) body is extended. When the car is lowered again and the damper compresses, the helper spring is squashed flat and the main spring operates as normal. Different manufacturers supply different springs with their kits. The Avo Sport Evolution kit contains 240lbs front and 200lbs rear springs, and the Spax RSX softer 175lbs front and 130lbs rears. Strut braces are metal bars that affix to the tops of the suspension struts. Most commonly used on the front turrets, they are also available for the rear. The purpose of the strut brace is to prevent the suspension turrets from flexing during hard acceleration and cornering. This has the effect of both reducing torque steer away from the line, and enhancing the car’s cornering ability. Rear strut braces stiffen the rear of the car but have the disadvantage of taking up boot space. They do make a useful anchor point for harnesses though.